A German Army Fuchs vehicle. An Adelaide company has launched a bid to service thousands of armoured personnel carriers (APC) used by the German Army with its innovative technology. Magill-based Supashock has put forward its passive air-assist dampers technology as part of its bid to secure a multimillion-dollar contract. 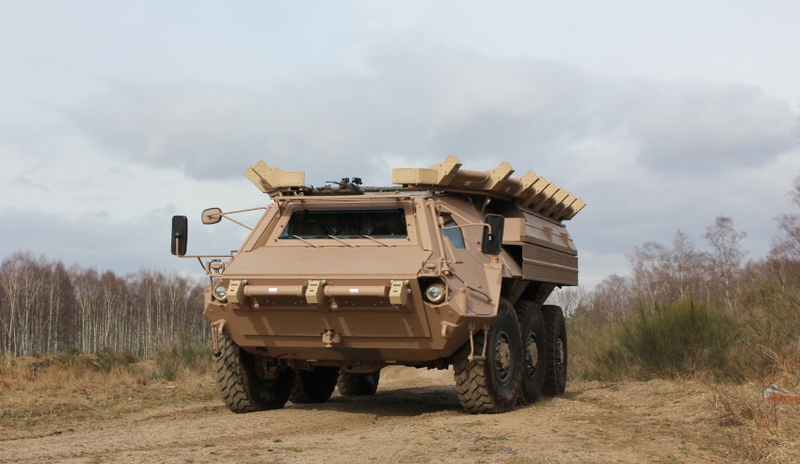 Under the bid, its damper technology would be fitted to the current Fuchs 2 APC, a vehicle manufactured by LAND 400 Phase 2 bidder Rheinmetall Defence and in-service across the German Armed Forces. Supashock specialises in designs, development and manufacture of shock absorbers, as well as state-of-the-art active suspension for automotive applications to improve performance, safety and ride quality on motorsport vehicles and military vehicles. Through comparative testing, Supashock’s suspension technology is already improving the mobility of Rheinmetall’s fleet of logistics vehicles, while enhancing on-road safety and reducing shock and vibration. Rheinmetall Defence Australia managing director Gary Stewart said the Supashock technology would increase the capability and safety of RMMV’s Fuchs APC in demanding on and off-road environments. "We are strong believers in the technology that Supashock has developed as it will provide a step change in the performance of our vehicles and the Fuchs project is an exciting stage in our partnership," Stewart said. "This will deliver real benefits for the Australian economy through the accelerated generation of local jobs, while creating substantial export opportunities for Supashock. We see the close co-operation between the companies as a platform for an integrated approach towards the global expansion of Supashock into the military and commercial vehicle markets." Managing director and founder of Supashock Oscar Fiorinotto said securing the Fuchs project is a boon for South Australia's industry that is still suffering from the wind-down of the automotive industry. "This is an example of how we can drive future growth and continue to create highly skilled, enduring jobs in South Australia while delivering significant performance improvements to customers in export markets," Fiorinotto said. Rheinmetall approached Supashock in December last year with a range of issues presented by the existing Fuchs family of vehicles, seeking a proposal to improve the vehicle ride quality and handling characteristics. Supashock is developing a system that will deliver improvements in tactical mobility, dynamic handling – particularly roll control and damping of pitch oscillations – vehicle and weapon station stability, load carrying capacity and future growth potential. Under the program overseen by Rheinmetall and its truck subsidiary Rheinmetall MAN Military Vehicles, Supashock with move through three phases. Phase 1 will include development and simulation of passive air-assist damper, revised springs and redesigned bump stop to achieve the desired improvements in vehicle performance. The redesign will integrate Supashock passive dampers, while retaining the existing Fuchs 2 suspension geometry. Supashock's partnership with Rheinmetall was formally cemented last year when the companies signed an agreement in July, which saw the defence giant acquire 49 per cent of the Adelaide company. Rheinmetall is working with Supashock to form a key part of its global supply chain to export its technology, along with its other LAND 400 Phase 2 partners Heuch, Tectonica Australia, Cablex, Direct Edge, G&O Kert, Hilton Manufacturing, Hoffman Engineering, Nezkot Precision Tooling and Engineering, Plasteel and Redarc.